Tumors of epithelial origin (carcinomas) are of major medical importance (DeVita et al. 1993). Multiple genetic changes in dominant and recessive oncogenes that contribute to carcinoma formation and progression have been identified. The most frequent mutations found in carcinomas include activating mutations in the ras family of genes, mutations that interfere with the function of p53, and amplification or overexpression of genes encoding tyrosine kinase receptors (Barbacid 1987; Aronson 1991; Hollstein et al. 1991; Vogelstein and Kinzler 1993; Hinds and Weinberg 1994). These mutations affect both the growth and the genetic stability of affected cells. A further critical step in the development of malignant carcinomas is their ability to invade the underlying tissue and to metastasize to distant sites. 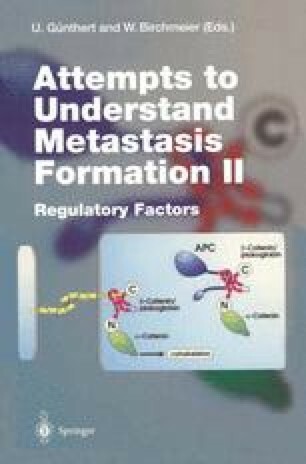 Early genetic approaches for the analysis of oncogenes have focused mainly on the induction of transformation, i.e., unregulated growth in fibroblasts, which has led in the past decade to a wealth of data on the pathways controlling normal and aberrant growth. In comparison, there has been a lag in understanding the molecular causes leading to the acquisition of the metastatic potential of carcinoma cells.